Two HOK workplace experts share what you need to know. Are you paying attention to coworking? Consider the following data: In just over a decade, the number of dedicated coworking spaces worldwide has grown from zero to 11,000. By 2020, another 15,000 of these shared workspaces will come online and membership to these facilities could eclipse 3.8 million users. Here is another stat worth knowing: Despite its meteoric growth, coworking still accounts for less than one percent of global office space, and its overall slice of the pie is expected to remain but a sliver (less than four percent) for the foreseeable future. Given these contradictory viewpoints, how should workplace designers approach coworking? At HOK, we’ve developed five key insights we often share with clients who are considering coworking. WeWork’s NYC Charging Bull location. Fewer and fewer employees think of work as something that has to be done within the traditional office. As many as 80 percent of knowledge workers report spending at least one day a week working remotely. These professionals tend to view the office as just the first of their workplace options. Home is often a second workplace, and a coffee shop or public space, such as a library, is a third alternative. Recently, however, the composition of coworking has shifted. Salaried workers now represent slightly more than half of all coworkers as more and more employers — including GE, Delta Airlines, and KPMG, among others — have seized upon coworking as a solution to workspace shortages and housing for remote or temporary staff. Surveys shows that both employees and freelancers prefer coworking spaces over traditional office environments. According to the industry trade publication Deskmag, 79 percent of coworking members report being happy at work compared to just 59 percent of non-coworkers. Additionally, 71 percent of coworkers say they’re more productive in a coworking space; 68 percent say they’re better able to focus; and 62 percent believe the quality of their work is better. Anecdotally, many of these same coworkers say they enjoy the social aspects of the open and shared workspace and the ability to share ideas with like-minded professionals. Coworking offers employers several advantages, particularly when it comes to real estate inventory and human capital. Employees, as we just mentioned, usually express favorable opinions of coworking. Those who have the flexibility to work remotely a day or two each week actually report feeling more engaged in their jobs than those who work in the office every day. 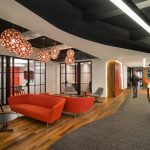 Several large companies have begun experimenting with coworking as a way to connect with innovators and tap into talent. Verizon, for example, last year converted part of its Manhattan office into coworking space that, according to the company’s global head of real estate, will help the telecom stay “engaged in the [tech] community.” Verizon plans to open up additional coworking spaces elsewhere in properties it owns but does not use to full capacity, particularly within the buildings it owns from its days as a land-line phone operator. In St. Louis, our design team worked to transform a similar property (built in the 1940s as a telephone handset factory) into @4240, an innovation center that houses numerous startups, anchor tenants, and the coworking space CIC St. Louis. The building features open meeting areas and casual indoor and outdoor gathering spots designed to encourage collaboration and play. Coworking has provided new life for many historic buildings like @4240, with nearly half of today’s coworking spaces found in structures that are more than 50-years-old. Now that we’ve covered some of coworking’s perks, let’s examine the risks. Arguably the biggest uncertainty is that it’s impossible to know if tomorrow’s employees will appreciate coworking quite as much as today’s workers. In addition, market forces and competition may present immediate challenges to coworking. The coworking model requires large membership to cover operating costs. Yet with the average U.S. coworker keeping a membership for just under 20 months, membership to these facilities is in constant flux. Lease rates could also prove to be a factor. Most coworking spaces sprouted up in the wake of the Great Recession, when real estate was relatively inexpensive. In 2018, the leases for nearly half of all coworking spaces are expected to be up for renewal. It could be, too, that coworking has already reached market saturation in many large U.S. and European cities, where operators such as WeWork have opened multiple shared workspaces. Competition doesn’t pose quite such a risk in Asia and Latin America, though there the coworking model has yet to experience strong demand. Ultimately, whether or not a business or organization should pursue coworking can only be made on a case-by-case basis. For many employers, particularly those that require lots of in-person collaboration, coworking may not be an option. For others, there are many questions to address. How will the space reflect your corporate brand or identity? What is the goal of the coworking space? Is it to monetize unused real estate? Increase employee productivity? Connect with the community? How will the space incorporate the needs and preferences of all workers? And how might those needs change over time? What other coworking spaces can be found nearby and how are they being used? Based on its tremendous growth this past decade, it’s clear that coworking is much more than a fad. In our design studios, we’re talking about how this relatively young concept of coworking will evolve over time and what it might look like in 2030 and beyond. For a deeper examination into the past and future of coworking, download HOK’s free white paper, “Coworking: A Corporate Real Estate Perspective“.